The practice weapon for the small-sword, evolved in the late seventeenth century, when cutting became an obsolete action, and accordingly, a flat blade was no longer required for training. The word is derived from the French refouler, to turn back, and had long been in use in England to describe any rebated weapon, including lances and the like. Foils in this country were simply blunted weapons. The original French foil was known as the fleuret, from a fancied resemblance between its leather button and flower bud. The foil of that period was appreciably shorter than its modern counterpart. Liancour, the famous French master, advocated the use of several different types of foil in the salle, including a heavy, guardless weapon for the pupil which was also shorter than that of the master, whose own weapon, for the purpose of avoiding excessive fatigue, was lighter than usual. Within the last decade or so, one prominent London fencing master was known to make his pupils take their lessons with a monstrosity of his own devising, two blades somehow fitted into a single hilt, which occasioned the muscles of the sword-arm the most exquisite agony, the idea probably being that if they could manipulate a weapon of this weight, they could manipulate anything. Various patterns of guards have found favor at different times. “Figure-of-eight” guards and narrow, slightly convex, rectangular guards have found favor and given place in turn to the contemporary saucer-shaped guard, a smaller edition of the epee cup guard. The foil has been the dominant factor in the development of modern fencing. Even sabre fencing, though involving the cut, and so introducing an entirely different factor, is limited by the conventions governing the right to attack, riposte, counter-attack, and so forth, identical to those at foil. The sabre target is also limited. 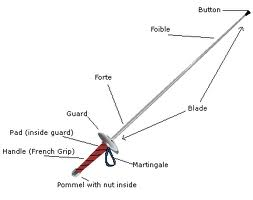 This is, of course, not so at epee, but the fact remains that the terminology and basic concept of sword-play are akin to the foil, although naturally, the tactics and application of the basic system must be greatly modified at this weapon. For long the epee was regarded as the dueling weapon as such, while the sabre before 1939, was regarded as a specialty of the Hungarians and not practiced very widely in England outside the Services. Thirty or forty years ago, the fencing masters were still reluctant to give sabre or epee lessons except to those about to participate in matches or competitions, of which there were then vastly fewer. For them, the foil reigned supreme – precise, formal and elegant.